What’s going on in the Women’s bathroom? I have a serious question. what the heck is going on in the women’s bathroom? It seems that everyone wants to be in there. I’m wondering if maybe I want to be in there too. I see stories everyday now about how someone should be able to use the bathroom of their choice. The one that fits their “identity”. The bathroom they feel most comfortable in. If that’s truly the case, why not the men’s room? I’ve used the guy’s bathroom all my life, and as far as I can tell, it’s pretty laid back in there. It’s very comfortable. No one bothers you, heck you barely make eye-contact with anyone. You just get in, do your business and get out. Now, to be fair, I’ve never used the women’s bathroom, I’m not sure I’ve ever actually been in one. There must be something going on in there that is worth all this attention. There has to be. In fact, I feel like I want to go see what all the hub bub is. Is the fact that I “feel” like I want to go in there enough to grant me access and enough to trump the “feelings” of those that might not want me in there? I don’t know. I feel like it is. All the talk about minimum wage has died down just a bit but, I recently came across a conversation on social media about the minimum wage that included this meme. It got me thinking about what the minimum wage really is. Some would argue that a minimum wage should be a wage that is “at least” what you need to survive and raise family. I would argue that it should be the “least” you need to barely get buy. A minimum wage is just that – a “minimum” wage. In my opinion, it should not be a wage you feel comfortable with. It should not be enough to raise a family of four on, it should not be enough to keep you satisfied. It should however, be barley enough to get you started and low enough to make you want to do something about your situation and force you to strive for something more. Who Are The Real Racists Among Us? They say everyone should be color blind, yet they won’t let anyone forget about color. Every form I fill out, ever questionnaire I take, even questions asked over the phone – they want to know what nationality I am. I always thought I was an American. Apparently I’m white with Hispanic descent. Does that make me brown or white? Does it matter? It doesn’t to me. Well, at least it didn’t until recently. Apparently it’s important since every time I talk to someone in an official capacity, they want to know. Came across this little gem posted by someone named Average Joe-919387 in the list of user comments on NBC’s website under an article that (finally) came to the realization that they, the Obama Administration, lied about the ACHA…. Shocker. I know. Anyway – here’s a short anecdotal story that explains the difference between Democrats and Republicans. A Republican and a Democrat were walking down the street when they came to a homeless person. The Republican gave the homeless person his business card and told him to come to his business for a job. He then took twenty dollars out of his pocket and gave it to the homeless person. The Democrat was very impressed, and when they came to another homeless person, he decided to help. He walked over to the homeless person and gave him directions to the welfare office. He then reached into the Republican’s pocket and gave the homeless person fifty dollars. It’s short, but it seems to accurately sum up the difference as it relates to the way ‘compassionate’ liberals and Democrat tend to look a the world as opposed to the way most republicans and conservatives look at it. This goes back the old “feed a man a fish.” adage, and it continues to hold true. If you can’t see that by now, then we are all lost. Tango, my new Yellow Eyed Kole Tang is a cool little fish. He spends his days inspecting and picking at the rock and substrate. He has tons of personality – I mean , just look at this photo. I jumped at the chance to bring one these fish into the tank as a juvenile because I wanted to give him the best chance of fitting in. At his small size, the other fish don’t see him as any sort of threat or as competition. He also has a great domineer, allowing him to fit right in. 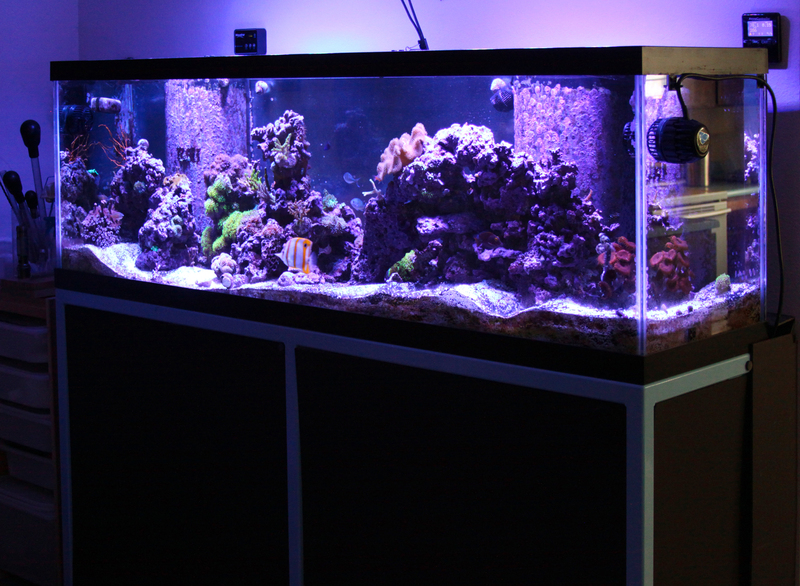 We made Tank of the Week (TOTW) over at AquaticLog.com – how cool is that. So I recently entered a photo contest at 3reef.com. Unlike other “photo contests” though, this one had a cool twist. The task was create a beer label design using photos from your own tank. Of course when I read about this I had to enter. I mean – who doesn’t love beer, and saltwater aquariums? To win it, I knew it needed to be clever and had look good. So I started shooting a few images of the new tank but still didn’t have any good ideas was to what it should be. After looking through the photos and coming across a particularly nice shot of Kora, the Yellow Coris Wrasse, I came up with “Coris Light” – an obvious play on words for “Coors Light”. I had to win. I shared my idea with my better half, Darlene, and she loved it. She then came up with the tag line that tied it all together; “Better than all the wrasse so you can goby all you can be“. I personally believe that’s what pushed my entry over the edge and got me the extra few votes that ultimately allowed me to win. Ddinox64 on What’s going on in the Women’s bathroom?